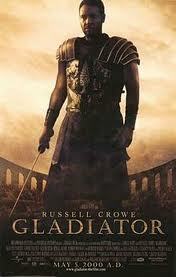 Review: A Roman general comes to Rome as a Gladiator in order to seek revenge. All of his family were murdered and betrayed by an emperor’s corrupt son. One not to miss!! A complete classic!! At the Oscars in 2001 it won Best Actor in a Leading Role-Russell Crowe, Best Costume Design, Best Effects-Visual Effects, Best Picture and Best Sound. At the Baftas it won Best Cinematography, Best Editing, Best Film and Best Production Design. At the Golden Globes it won Best Motion Picture and Best Original Score-Motion Picture. In the Colosseum scenes, only the bottom two decks are actually filled with people. The other thousands of people are all computer animated. This is listed in Barry Norman’s top 100 favorite films and also his top 50 Greatest British Films that was published in the Radio Times.